Town boss Jamie Fullarton wants his side to seize their opportunity when they host AFC Wimbledon in the FA Cup second round on Saturday (12.30). The clash will be screened live on BT Sport, and will see The Shaymen reach the third round for the first time since reforming in 2008 if they win. Halifax are believed to have already pocketed £136,000 from their FA Cup run in prize money and TV income alone, and will earn an additional £54,000 with victory on Saturday. Standing in their way are Wimbledon, who are second bottom of League One on goal difference and go into the clash on the back of a 1-0 defeat at Peterborough on Tuesday. They have won three of their last five games after a miserable run of 10 defeats from their previous 11 matches. It was reported on Wednesday that former Notts County and Leyton Orient boss Kevin Nolan had turned down the chance to be the next Dons boss, so caretaker-manager Simon Bassey, who has overseen one win and two defeats, looks set to remain in charge. It is reported that Russell Slade, Shaun Derry and former Wimbledon player Wally Downes will now be considered for the role. On tomorrow’s opponents, Fullarton said: “They’re League One for a start, and having won promotion like they have, through the divisions, there’s still a thread of people that have been part of that, and understand coming to play against lower league teams, having been in that league themselves not so long ago. “Neal Ardley did a great job there. Obviously he’s moved on now, and by all accounts, by the time we play them on Saturday they could have a new manager in place, which adds that spark and bounce you sometimes get. Town were awful in their 4-0 defeat at Ebbsfleet last Saturday, but were excellent in overcoming Morecambe in the last round, and outplayed the League Two side in a first-half full of energy and work rate. Is Fullarton seeking a similar performance, rather than setting out to sit back and protect their own goal? “Win, lose or draw, in general, over the piece, I don’t think it’s in the psyche or the DNA of the group of players we have to do that. “No matter who you play - Wimbledon, Morecambe or a team in our division such as Salford, Sutton or Leyton Orient - if you take that mentality, then you invite pressure from the first minute, and then 95 minutes becomes a long time. “So you’ve got to seize the opportunity. “We’ll be looking for energy, and (to be) aggressive with and without the ball. That’s not a physical action, that’s a mindset towards what you’re doing, with positivity. “It’s that old cliche of ‘have a go’. 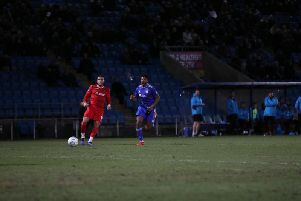 The players took that upon themselves in both games against Morecambe. “It’s exactly what will be required for any cup game, whether it’s Wimbledon at home in the FA Cup, or Barrow away in the FA Trophy. “Those are ingredients you look to instill over a period of time throughout your campaign. Fullarton admits the game carries added significance, but is focusing on the match itself as opposed to the extra attention the televised tie brings. “We’ve beaten a league side for the first time since the club reformed, and it’s only the second time I think that we’ve reached round two of the FA Cup, we’ve never reached the third round since we reformed,” he said. “There’s a lot to gain. From the players’ point of view and the staff, it’s an opportunity to play against a League One side, and pit yourself against them. “It’s a cup game, and it’s the romance of the cup that people bang on about, although I’m more pragmatic than that. “It does give an added edge to the game, being on TV, having the opportunity to go to a stage the club hasn’t been to, the financial implications. “There’s many aspects for the club, the players, the staff, the town. “But come Saturday, at 12.30, that’s passed, and what happens in those next 95 minutes determines what follows. On the possibility of reaching the third round and the potential of a money-spinning draw, Fullarton said: “I don’t work off of what if scenarios, although I prepare vigorously for every what if scenario possible. “It’s vital for any manager to try and add balance to the preparation, and be consistent with how you prepare and your behaviour. the game takes care of itself. “I won’t be dampening things, I’ll be channeling that enthusiasm, that adrenaline, the fact it’s the FA Cup, on TV, against a league side - can we channel that in the right manner to give us a positive energy? Will Town’s heavy defeat at Ebbsfleet last Saturday play any part in Fullarton’s pre-match pep talks? “If you do that, it only works so often. You generate a dead arm effect there. The first punch you get works, but when you keep punching the same place, the same way, it has no impact. “Everyone has a different way of working. But if we do well and we win, we move on, and our focus is the next thing. “I think that’s a key factor. Whilst we were disappointed with the performance, and the result, Saturday’s a totally different proposition for us. Town’s win over Football League side Morecambe in the last round should give the players some belief that they can repeat the trick against Wimbledon. “What you’re looking at to enhance belief is making sure the players understand what we are, and prepare in that way,” said Fullarton. “We’re aiming for a winning mentality, for any game. What does that look like? It doesn’t matter who you’re playing, a winning mentality gives you the best opportunity to win the game. “It’s not reinventing the wheel. It means when the team walks out on that pitch, they genuinely believe they’ve got an opportunity to win the game. “How does that manifest itself? That they’re physically prepared to work to the level required for 95 minutes, they’re armed with a plan tactically to exploit the opposition’s weakness whilst negating their strengths, and it’s being technically proficient enough to be able to cope at the level you’re playing at. “All those combined generate that belief you can win.